Last night I began my beer odyssey at the Moan and Dove, ranked as one of the best beer bars by some, and a place I have been drinking beer at for the past 3 or 4 years. By beer odyssey I mean that I am going to attempt to drink 160 or so different beers in the next year. It’s sort of a club they have at the Moan: finish all the beers listed on this card in the next year and you get a huge mug with your name on it. AND, in that mug, forever, you can put beer. Even if they are pouring a small beer, you get a big beer for the same price, which to me isn’t really the point of the whole exercise; the point is to expand my knowledge of beer. Lindemans PÃªche was the first beer that I tried on the card. I was going to try my favorite first, which is a Flemish sour brown ale, but they were out of stock. Then the knowledgeable bartender Mark told me to save my favorites for the “dark days,” whatever they might be. Is there really a dark day when you drink a beer? Honestly, I’ve never had a beer that I absolutely hated to the point of throwing it out; even a “lawnmower beer” has its time and place. 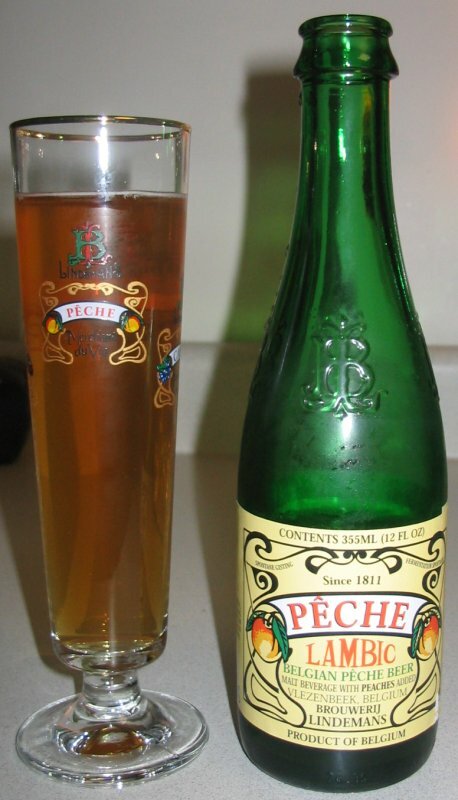 As much as I can, I’m going to keep tasting notes on each of the beers I drink during the next year, and here’s what I have to say about Lindemans PÃªche, a Lambic style fruit beer from Belgium. I’m not a big fan of having fruit in my beer, that’s why this one kicked off the odyssey. This peach beer isn’t too bad. Yes, there is peach flavor (a clean taste, not like artificial or rotten peaches), and there is an underlying beer taste among the peach essence. I’d recommend drinking this beer with food: some cheeses, deserts (maybe a cheese cake without fruit on top), or . . . I don’t know why I’m feeling this, but maybe some good potato fries with malt vinegar and salt. Is drinking 160 different beers in a year so tough? It’s been done by many people at the Moan, so I should be able to do it. And at this point in my life, I need a goal I can accomplish, even if it’s a small, pleasurable one like drinking a lot of beer.